Interested in joining us for a life changing experience with God? Our next Mission Trip will be held on May 9-19th, 2019. 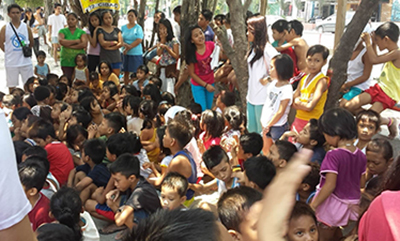 We will again be working in the Metro Manila area near the Maiden’s Hope Home. The exact activities of each trip are defined by the desires and abilities of the team members and may include activities like VBS, basketball clinics, construction, food distribution, finger nail painting, music, dental clinics, marriage conference, bicycle repair… basically if you have a skill or calling, we can put it to good use. Although we make tentative plans for our activities during the trip, God is our ultimate planner and often leads us in unexpected directions. One of the requirements of the trip is to be flexible and open to God’s leading! Expect to be fully immersed in the local culture of Manila. Expect to be out of your comfort zone. Expect to meet many, many new smiling faces. Expect to have new experiences and to try new things. Expect to share God’s love with others. Expect to grow in your faith. Expect to feel overwhelmed and under-equipped. Expect to have an experience with God! Are there Safety Concerns in the Philippines? We operate outside of downtown Manila, in the Navotas area. To date, we have not experienced any incidents of hostility or serious safety concerns however, we do take safety very seriously and as such, we travel as a group and always with local residents. We follow their safety recommendations. There have not been any reported cases of terrorism activity anywhere near our areas of operation. Deadline for registration is tentatively set for March 1. We will be purchasing airline tickets shortly after that date. A valid U.S. passport is required. The size of the group will be no more than 15 people. If you have questions or would like to register for the trip, please contact Carol Jensen 208.424.0609 or email info@maidenshope.org.